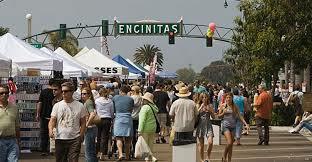 The Encinitas Holiday Street Fair is located down the center of six blocks of scenic South Coast Highway 101, two blocks from the Pacific Ocean. Formerly known as “The Fall Festival”. The Fall Street Fair is a one day event, continuous since 1989, children’s rides, two stages of live entertainment and food and drink refreshments provide an attractive setting for the public and a great boon to our vendors. Plus, the 40+ restaurants and bars in our downtown. The emphasis of is on arts, handmade crafts, antiques, and ethnic imports. However, commercial vendors will be accepted and admitted upon consideration of merchandise and display appearance.